I am always on the look out for a good cookie recipe to add to my collection. Pumpkin Cookies are my latest addition. It seems that cookies can be classified as either everyday, holiday, or seasonal. I would put Pumpkin Cookies in the seasonal category as they have the look, smell, and taste of Fall. Pumpkin Cookies are a soft and spongy textured cookie with the earthy flavor of pumpkin and its complementary spices (ground cinnamon, ginger, and cloves). They go very well with a tangy cream cheese frosting. But if you are putting these cookies in your child's lunchbox, you may want to leave off the frosting and instead add either one cup of chopped nuts or chocolate chips (semi sweet or milk) to the batter. When you read through the recipe you may be surprised to find oil listed as one of the ingredients. 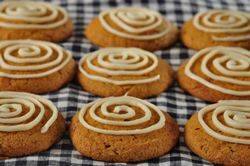 Most Pumpkin Cookie recipes use butter, but while oil may be tasteless and odorless, it makes up for this by giving the cookies a lovely soft and spongy texture, similar to that of a moist cake. I adapted this recipe from Elinor Klivans' excellent cookbook Big Fat Cookies which is a perfect name for these these cookies as they are just that, big and fat. For Pumpkin Cookies: Preheat oven to 325 degrees F (165 degrees C) and place oven rack in the center of the oven. Line two baking sheets with parchment paper. In the bowl of your electric mixer, or with a hand mixer, beat the eggs and sugar until light and smooth (about 2 minutes). Beat in the oil, vanilla extract, and pumpkin puree. Add the flour mixture and beat just until incorporated. Using 1/4 cup of batter (can use a small ice cream scoop or measuring cup) place small mounds of batter onto the prepared baking sheet, spacing about 2 inches (5 cm) apart. Bake for about 15 - 18 minutes or until a toothpick inserted in the center of a cookie comes out clean. Remove from oven and transfer to a wire rack to cool completely before frosting. Place small dollops of the frosting on each cookie or put the frosting in a piping bag, fitted with a small plain tip, and pipe swirls of frosting on the top of each cookie. Store frosted cookies in the refrigerator. Frosting: Beat the cream cheese and butter until soft and creamy. Beat in the confectioners' sugar and vanilla until the frosting is soft and creamy and of spreading consistency. Klivans, Elinor. Big Fat Cookies. Chronicle Books. San Francisco: 2005. Note: Instead of frosting the cookies, you could add to the batter either 1 cup of chopped nuts or 1 cup of chocolate chips.